The most beautiful jewelry of all, for me, is the kind that is passed down as an heirloom or perhaps purchased at an estate sale. Sometimes a piece is found at a antique store, the kind of place that knocks your socks off! I found a store like this about 4 years ago when I was at an antique market (located in Chicago), and the cases upon cases of estate jewelry had me just about hyperventilating. I'd never seen the true possibilities until then. Today I have some stunning pieces to show that come from Doyle & Doyle (doyledoyle.com). It was so hard to pick just a few, and I think I might have decided on too many! They break down the pieces into their periods and give very interesting stories behind much of the work. It seems that I have a particular appreciation for art deco jewelry. Here are a few favorites. 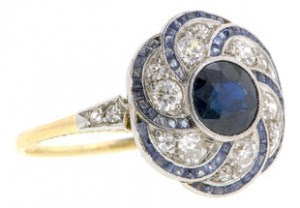 An art deco sapphire ring. A pink flower that would be sweet on a pinky finger (my mom has a similar pinky ring and we all love it). Art Nouveau designers were influenced by Japanese artists and created jewelry which comprised of fluid, sinuous lines. 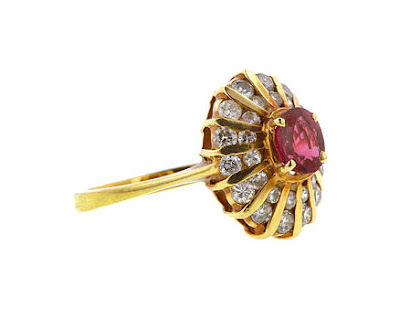 Jewelry was inspired by nature, with an exotic flair. 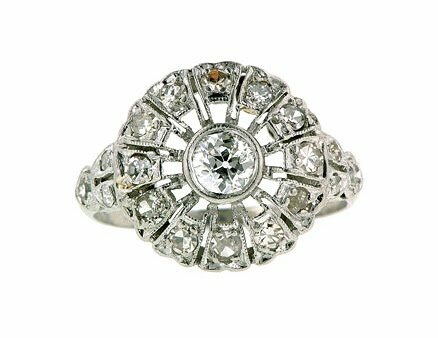 An engagement ring with dramatic flair! 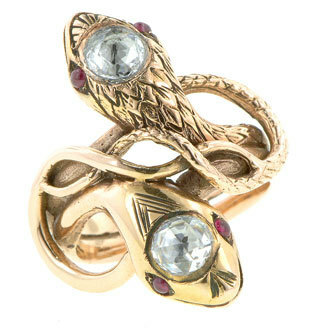 Now this snake ring seems a little against the grain, standing out amongst other obviously antique gems as a little trendy perhaps. But the tale tells that Queen Victoria's wedding ring from Prince Albert was a snake biting it's own tail, which represents everlasting love. It's from the Victorian era and perfectly mesmerizing. I found this ring to be so surprising and was completely wowed. 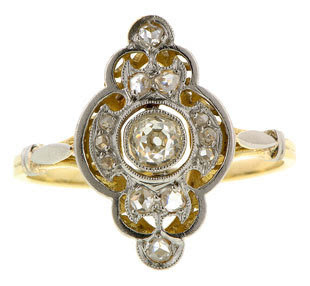 It's a German wedding ring from 1600-1650 (from the Victoria & Albert Museum’s online archives). "Two hands grasp an enameled diamond-set heart when the ring is worn, but when the ring is free from the finger, you can see it is actually comprised of three separate rings that rotate open to reveal secret engraving. On the insides of the shank, a portion of the marriage vows reads in German: “My beginning and my end” and “What God has joined together let no man put asunder”. 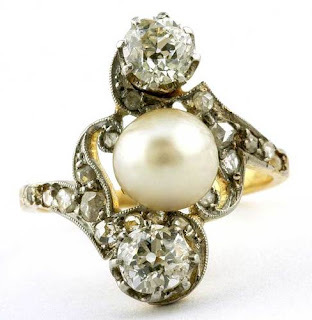 Beyond the ring’s aesthetic value, this masterpiece is a historically-loaded combination of three styles of old rings: posy, gimmel, and fede rings." So glad that you love our selection! 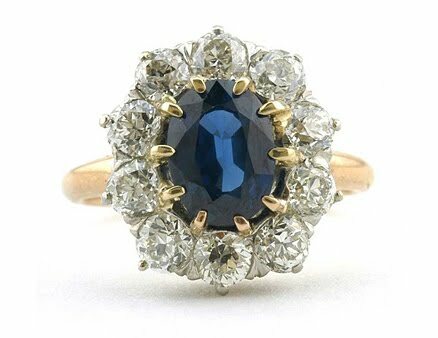 I completely agree with you about the heirloom nature of jewelry - the best pieces are those associated with a great memory or life event. My current favorite at the store is actually that diamond and emerald Georgian ring you picked out! If you ever come to New York, you must stop by!